This Black Forest Cupcakes Recipe is made from scratch with a cherry filling and a homemade whipped cream frosting. Making these cupcakes have been on my list for quite some time and I can’t believe that I’m just getting around to share them! I’ve always been a fan of Black Forest Cake so making a cupcake version was definitely on my list. The juicy fruit filling makes this cupcake stand out and the homemade whipped cream frosting makes this cupcake light and flavorful. Making these cupcakes are quite simple. Everything is made from scratch except the cherry filling. You can of course make your own but I just use a can of cherry filling, add 1/4 cup of sugar to it and voila, you have a quick and easy filling. I use the back-end of a Wilton 1M tip to make the hole in the center of the cupcake. After pulling out the center of the cupcake, I spooned cherry filling into the hole and then topped it off with the homemade whipped cream frosting. I garnished the cupcake with a fresh cherry and chocolate shavings. 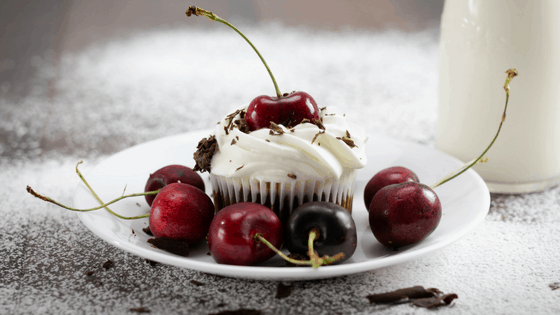 These Black Forest Cupcakes turn into quite the treat! To help stabilize the whipped cream frosting, I used unflavored gelatin to the frosting mixture. It does need to be refrigerated right away if you’re not serving it however. The amount of gelatin I used helps keep the frosting’s shape without altering the texture or flavor. These Black Forest Cupcakes are made from scratch with a cherry filling and a homemade whipped cream frosting. Mix together butter and eggs. Adding eggs 1 at a time. Do not over mix. Sift together flour, cocoa, baking soda, and salt in separate bowl. Add half of flour mixture to wet ingredients and lightly blend. Add in 1/2 cup milk and then rest of flour mixture. Stir in hot water, careful not to over mix. Bake for about 15 minutes, checking for toothpick to come out clean. Using a chilled bowl and whisk, beat heavy cream until desired peaks form. Add in vanilla and sifted powdered sugar. Pipe onto cupcakes right away and either consume or refrigerate. Heat cherry filling and sugar on the stove. Remove from heat once the sugar is blended. Once the cupcakes are baked and cooled, use a piping tip to remove the center from cupcakes. Fill with cherry filling and replace the removed piece of cupcake. Make sure that cupcakes are cool or the filling will sink through the cupcakes and will not stay in the center. Using unflavored gelatin helps the frosting keep it's shape. You will get a lighter and fluffier cupcake if don't over mix. Like this recipe? Check out my recipe for Vanilla Cinnamon Sugar Swirl Cupcakes here! Follow me on Facebook and Pinterest to be the first to know about my new recipes! omg that filling! I’ve been on a major cherry kick this summer and these cupcakes are so perfect for using up my remaining stock (before I go out and buy more!). So delicious! What beautiful cupcakes! I love cherry anything and everything. It would be hard to eat just one! Cherries & Chocolate just belong together. Love that combo and these cupcakes sound amazing! Love that you put cherries in the inside! What a fun surprise! OMG, yes! What a smart way to control the portions I consume of my FAVORITE cake! I so much love this cupcake filling so fantastic. And I love the recipe,I will definitely try it out.